Bioengineering and MicroElectroMechanical Systems (MEMS): Atomic force microscopy, multivalency, pathogen adhesion and endocytosis, cell biomechanics, single molecule biophysics, drug delivery and targeting, cell membrane mimetics, biosensors. Todd Sulchek is an associate professor in Mechanical Engineering at Georgia Tech where he conducts fundamental and applied research in the field of biophysics. 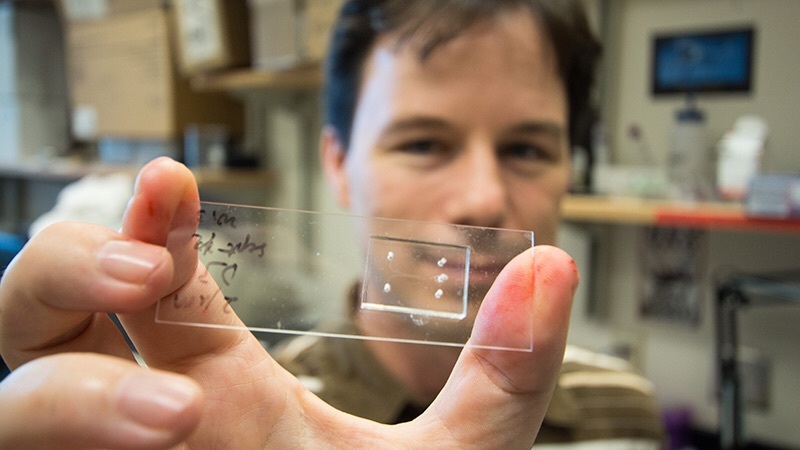 His research program focuses on the mechanical and adhesive properties of cell and biological systems and the development of microsystems to aid in their study. His research employs tools, including, MEMS, microfluidics, imaging, and patterning to understand or enable biological systems. His interests include cancer diagnostics, stem cell biomanufacturing, novel therapeutics, and ultracheap engineering tools. He is a member of the interdisciplinary Institute for Bioengineering and Bioscience. Dr. Sulchek also holds program faculty positions in Bioengineering and Biomedical Engineering and has a courtesy appointment in the School of Biology. He received his PhD from Stanford in Applied Physics under Calvin Quate and received a bachelors in math and physics from Johns Hopkins. He was a postdoc and staff scientist at Lawrence Livermore National Lab. He joined Georgia Tech in 2008 as an Assistant Professor of Mechanical Engineering. He is a recipient of the NSF CAREER award, the BP Junior Faculty Teaching Excellence Award, the Lockheed Inspirational Young Faculty award, and the 2012 Petit Institute Above and Beyond Award. To date he has published 42 journal papers and has filed or been issued 7 patents. Prof. Sulchek is a strong supporter of undergraduate research, and he participates in a variety of undergraduate education activities including the Undergraduate Research Opportunities Program (UROP) and includes over 8 undergraduate authors in the past year.